The bindu, a dot, usually red or black should be placed on the wall at eye level and one should sit in front of it, at about an arms distance. Sit comfortably with the spine erect and eyes relaxed. First close the eyes and relax. Keep the body steady and stable throughout the practice. Open the eyes and gaze steadily at the point. Try not to blink or move the eyeballs, do not strain the eyes. Try to focus only on the point. When the eyes start to get tired or begin to water gently close them and gaze at the after image of the point in chidakash. When the image disappears open the eyes and repeat the process. Continue as many times as desired. After completing palm the eyes and if needed splash some cold water into the eyes. Light the candle and sit as per bindu tratak, an arms length away from the candle which should be at eye level. Make sure there is no draft in the room so that the flame can remain steady. It is best practiced at night so that the room can be dark and the focus can be directed on the candle more easily. 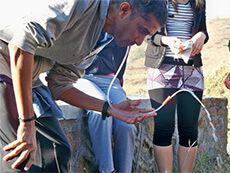 Follow the same procedure as bindu tratak but gaze at the tip of the wick, not the whole flame. Sometimes the flame may flicker but the wick will remain steady. Continue for as long as desired. Finish with palming and/or cold water. Curbs the changing and spontaneous tendency of the mind and channels it in one continuous stream, leading to one-pointedness. The flames must be steady, there should be no draught and no strain of the eyes. Bindu tratak should be practiced instead of jyoti tratak for epileptics and those with eyestrain or eye problems. Good lighting should be there for bindu tratak. One should build up slowly with tratak due to its mental cleansing effects so that one doesn’t become disturbed. Beginners should start with a few minutes in total. Later it can be practiced for up to 15 minutes. Kapalbhati is related to the breathing process but is classified under cleansing techniques. First sit in any comfortable sitting position with the hands on the knees. Relax the body and breathe naturally. Bring the awareness to the breath and abdomen. Inhale deeply and exhale with a forceful, but never straining, contraction of the abdominal muscles. The next inhalation will occur passively as the abdominal muscles relax and expand. There should not be any effort to inhale. Continue with the active exhalation and passive inhalation, which is the opposite of what we normally do. If necessary have a break, breathe naturally and then continue. Strengthens the nervous system due to its action of reversing the breathing process. If there is any dizziness stop the practice and breathe naturally. Recommence when ready but with less force. If it continues seek guidance. Avoid if there are heart problems, high blood pressure, lung problems, recent abdominal surgery, stroke, vertigo, epilepsy during pregnancy and menstruation. It is said that the ideal ration for kapalbhati is 120 repetitions per minute. Practicing faster than this is not advisable. If one cannot practice that speed they should do what is most comfortable for them. The amount of repetitions can slowly be increased as per the individual’s capacity and strength. One may start with 2 rounds of 20 repetitions and slowly build up to 2 rounds of 120 repetitions. After some time one can build up to 500 repetitions. Stand erect with a distance of 1 to 1.5 ft in between both the feet. Inhale. Bend the legs, place both the hands on the knees and exhale. The pressure of the shoulders should come onto the knees through both the hands. 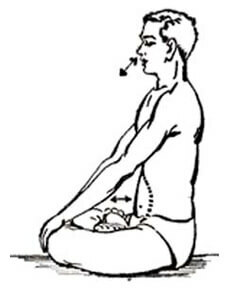 After exhaling completely contract the abdomen and bring it inwards, towards the spine. Immediately release the abdomen and continue the contraction and expansion in a rapid manner until you feel that you need to inhale. Stop the process and gradually inhale as you stand up, raising the arms upward and then exhaling lower the arms. This is one round. After completing as many rounds as desired lie down in shavasan and give a gentle clockwise massage to the abdomen. Removes impurities and improves the efficiency of all the organs. Digestion is improved and the agni or digestive fire is lit. Increases prana in general and stimulates all 5 pranas in the body. The pancreas is given a good massage which helps with insulin production and therefore diabetes. The movement of the stomach should not be jerky but should be done rhythmically. Avoid if there has been any abdominal surgery, high blood pressure, heart disease, ulcers, diarrhoea, menstruation, hernia, pregnancy and acidity. Always practice on an empty stomach and if possible, empty bladder and bowels. 3-4 rounds can be practiced, slowly increasing the amount of repetitions per round. 100 strokes per practice is a good amount to aim for. In a jug mix 1 teaspoon of water with 500 mls of warm water. Fill the neti pot with water. Usually the neti pot holds 125mls. Bend the knees and place one hand on the knee. Tilt the head to the side and insert the spout into the upper nostril. Keep the mouth open and breathe naturally through it. The water will naturally flow out of the lower nostril. Sometimes a little water may flow down the throat or face. In this case adjust the position of the head. Everybody is different and when the correct position has been found then it becomes very easy. Once all the water from the pot has gone through the nostrils repeat on the other side. This can be practiced twice if the pot holds 125mls otherwise use 500 mls of water. After practicing it is important to dry the nostrils. To do this lean forward and swing the head in a half rotation from side to side, exhaling forcefully but without tension as the head moves downwards, inhaling as the head comes up. If you feel there is still some water inside then till the head forward for some time then try blowing your nose, remembering not to strain. Those with blocked nostrils should not practice jal neti as it may cause a blockage of water inside the cavity. It is best as a preventative so instead practice when both nostrils are flowing. If you are prone to nose bleeding then again it is not recommended without advice. 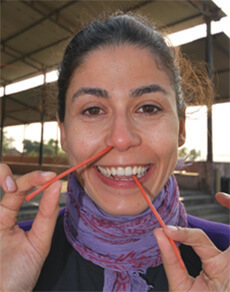 Placing a drop of warm ghee in each nostril before the practice can help. 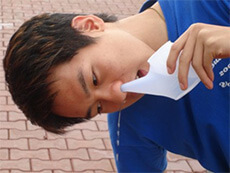 Also for some people they may have a structural blockage preventing the flow of water out of the other nostril. Ask your doctor about this. It can be practiced everyday if necessary but for a normal healthy individual once a week is adequate. If one has allergies then it can be practiced daily. Take a comfortable position, sitting or standing. Relax the body, breathe normally. Take your rubber tube and dip it in a few drops of ghee. Place the tube into one nostril. It is best to start with the nostril that is flowing first. Slowly and carefully continue to insert the tube. It will reach the nasal cavity and then one will be able to feel it in the throat. It is very important to go slowly here. Sometimes the tube will not go and one needs to gentle twist the tube until the correct position is found. There should never be any pain or discomfort. When the tube reaches the throat insert the index and middle finger into the throat to hold onto the tube. It will be very slippery at this point and may take some time to get a hold of. It is important that the fingernails are not long so that they do not scratch the throat. Once the tube is held very gentle move the tube to and fro, to gentle clean, and then slowly remove the tube from the mouth. Repeat with the other nostril. Has a friction effect which can be helpful if there are any fleshy outgrowths preventing the free flow of air. It helps with excess mucus/kapha so indirectly helps tonsillitis. Don’t practice is one has a deviated nasal septum or has nosebleeds. Always follow with jal neti to flush out any impurities or particles. It should always be practiced under guidance to begin with. There should never be any kind of pain or discomfort. Can be practiced weekly or if needed a few times a week. Prepare warm salted water to the proportion of 2 teaspoons salt per litre of water. Prepare about 2 litres of water. Sit in a squatting position or sitting down. Start drinking the water at a continuous speed. Do not sip the water slowly and do not drink very fast. The aim is to drink 6-8 glasses of water for proper cleansing. If one only takes a few glasses then the effect will not be there. With each glass of water one will become a little slower in drinking as the stomach fills up. Sometimes some nausea will be felt, try to overcome that, take a few breaths and continue. When one’s stomach is completely full and one feels they cannot take another sip then stand up, relax and press two fingers onto the back of the tongue. This pressure normally causes the water to be expelled automatically. Continue with this process until no more water can be expelled. If it is difficult to get the water up uddiyan bandha may be used. Take 10 minute shavasan. One can eat after 30 minutes. Helps remove cough, cold or congestion. Helps to remove excess acid if there is acidity and helps to increase the secretions if there is low acid. Improves the function of the stomach. Helps with all acid related problems such as headaches and migraines. Helps to remove mental blockages and suppressed emotions. The fingernails should not be long as this may cause scratching of the throat. Avoid if there is high blood pressure, heart disease, menstruation, pregnancy (except first trimester), stomach ulcer, diarrhoea, hernia, stroke, eye problems. One should practice in the morning, on an empty stomach. One can practice weekly or monthly. If one is having a lot of congestion or acidity it can be practiced daily for up to a week. Drink 2 glasses of plain water. Find a comfortable sitting position, squatting is ideal. Relax the body and breathe normally. Open the mouth and slowly insert the tube into the throat. Slightly chew, to produce saliva and swallow. Slowly the tube will move down the throat towards the stomach. One may feel some retching as the body tries to throw out the tube. Try to overcome this reflex and continue. Do not push the tube down hard, let it move slowly and carefully. Once the tube reaches the stomach water may automatically come out of the tube. Stand up and bend forward slightly to allow the tube to pull out all the water from the stomach. Sometimes it can take a bit of time because the mucus can block the tube. Practicing uddiyan bandha can be helpful to increase the pressure of the water. When no more water is coming out very slowly start to remove the tube. Do not pull it. The oesophagus may try to pull the tube downward. Relax and do not worry. Breathe normally and continue to gently pull the tube upwards and out. Take shavasan for ten minutes. The effect is similar to vaman but the benefits are more. Causes friction in the oesophagus and helps to stimulate the nerve plexus. It needs coordinated action of the three layers of oesophagus muscles, so improves oesophageal function. Helps remove excess mucus much more than vaman. Strong effect on the emotions, suppressed emotions, anxieties and fears. Avoid if there is high blood pressure, heart disease, menstruation, pregnancy, stomach ulcer, diarrhoea, hernia, stroke, eye problems. One should practice in the morning, on an empty stomach. Avoid if the throat is sore. One can practice weekly or monthly. Get a cotton cloth that is 2.5 cm wide. The length can vary, one can start with one metre and build up to three metres. The cloth should be soft and have no loose threads. Boil the cloth. Remove the cloth from the water and place in a bowl with a little water covering it and if desired a bit of honey. Also get a glass of water to drink. Take a sitting positon, ideally squatting if comfortable. Relax, breathe normally. Take one end of the cloth and fold the corners to make a point. Place it in the back of the mouth and start chewing the cloth and swallowing. Sip the water. The cloth should slowly start to move down the throat. The chewing action will increase the saliva that helps the sloth glide downwards. The cloth may bunch up a little in the back of the throat so it is essential to keep drinking water. As the cloth starts moving down one may feel nausea or retching. Try to relax till the sensation passes. Continue. As the cloth passes down the sensation will decrease slightly. Keep swallowing the cloth till there is only 30 cms left. It is very important that the cloth is held tightly at the end so that it does not go down the throat. Next stand up and practice nauli or agnisar. Sit back down and very slowly start to pull the cloth out gently. The body may try to pull the cloth back down. Do not get stressed about this but continue to relax, breathe and slowly pull the cloth out. Never pull on the cloth. Once it is out take shavasan for ten minutes. The autonomous nervous system is tones due to the person controlling the reflex urge to vomit. Cleans the stomach, removing toxins. This is the short version that can be practiced more frequently and without the restrictions that the master cleanse has. To practice, prepare 2 litres of warm water, add 4 teaspoons of salt and a few squeezes of lemon. Sit down, relax and drink two glasses of the water. Try to drink continuously, not too slowly and not too fast. After drinking the water practice two sets of the exercises. Again drink two glasses of water and practice two sets of exercise. Repeat this one more time. There should be a total of six glasses of water and six sets of exercise. Even four glasses and four sets can have a beneficial effect. After completing take at least 10 minutes of shavasan and wait for half an hour before eating. If one needs to go to the bathroom at any time one should do so. Some people will find that the water starts to come through before finishing the practice whilst others will find they have looser motions later in the day. If one has severe constipation then it may only soften the stools and the practice should be repeated the next day. Avoid if there is high blood pressure, heart disease, menstruation, pregnancy, stomach ulcer, diarrhoea, hernia, stroke, eye problems, any abdominal surgery. One should practice in the morning, on an empty stomach. Avoid if feeling tired or weak. Can be practiced weekly or monthly or even daily for up to a week if one is suffering from sever constipation. This practice takes physical and mental preparation. One should practice the sets of exercise, slowly building up, over a week. It is very important that this is practiced under the guidance of a yoga expert. To practice prepare 4 litres of water as per lagoo shankarprakshalan. Sit down, relax and drink two glasses of the water. Try to drink continuously, not too slowly and not too fast. After drinking the water practice two sets of the exercises, as per lagoo shankarprakshalan. Again drink two glasses of water and practice two sets of exercise. Continue to repeat this process. It is helpful to make a chart to note down how many glasses of water have been consumes and how many sets of exercise practiced. This process will continue until one starts to have bowel movements. From this moment on one needs to be aware of what is in the toilet and let their supervisor know so that if needed the amount to drink or the sets of exercise can be changed, as needed. Unless specified by the supervisor one continues with the two glass, two set routine. Generally most people will need between 14-16 glasses of water, but some will need less, only 8-10, whilst other may need more than 20. One will start to go to pass movements more frequently. When one starts to pass brown water it is time to stop the practice. Eventually the remaining water inside will also come out and that will lead to almost clear water coming out. It is very important not to overdo it because if one drinks too much then it can be difficult to stop the motions. When the practice is complete a one hour shavasan is needed. Please make sure that you DO NOT SLEEP as sleep will slow down the recovery process and may result in a cold or headache. After shavasan one should feel very hungry. This is the time to eat khichadi, the porridge of rice and mung dal. Ghee is essential to be taken to coat the intestines which now have no lining. It should be taken until the body produces a new mucus lining. If ghee is not taken it will lead to many problems. One needs to eat plenty of khichadi, at least two bowlfuls, to fill the intestines so that they do not spasm and cramp due to the absence of bulk. Eat as much as you comfortably can. Avoid drinking water as this will start the motions again. If one is very thirsty take a sip and hold it in the mouth and then swallow. One can start drinking water 2 hours after finishing the practice but avoid drinking huge amounts to start. Take one glass and then wait half an hour before the next glass. After eating rest and relax. One can now do yoga nidra and if wanted one can sleep. The rest of the day should be relaxing. There should be nothing strenuous. When one is hungry they should eat khichadi. Avoid going out in the sun. Avoid asanas. The next day rest should be taken and strong asanas or exercise avoided. Khichadi should be taken but vegetables can be added. Look below for what needs to be avoided after the practice. Removes indigestion, acidity and gases. Remove the mucus that may be in the digestive glands, improving enzyme production and therefore digestion. Removes excess blood sugar that causes diabetes. It has been found to be very useful for diabetes when combined with the partial cleanse. Improves both voluntary and involuntary muscle activity of intestines. Purifies the nadis, chakras and pranic body. In Gherand Samhita its says the body becomes like that of God, meaning energetic, charismatic, light and flexible body with concentrated pranic energies. Avoid if there is high blood pressure, heart disease, menstruation, pregnancy, stomach ulcer, colitis, diarrhoea, hernia, stroke, eye problems, those under 16 years of age, any abdominal, spine, heart or brain surgery. One should practice in the morning, on an empty stomach. Avoid if feeling tired or weak. One needs to be physically and mentally strong for this practice. Only practice once in six months. Please observe the silence during the process and focus on abdomen. While drinking the water, you should sit down and drink continuously but not fast. If you feel vomiting then stop the process temporarily and take a walk in shade focusing on breathing, resume the process when you are comfortable. Do not relax or do shavasana during the process as it will slow down the process of removing the water. If you feel giddiness or a headache then talk to the supervisor immediately. You can listen to relaxing music to keep your mind focused and relaxed during the process. Sometimes going to the toilet more than 8 times results in dehydration and weakness. Keep the supervisor updated with each trip to the toilet. Also do not exceed the point beyond which almost clear water is being passed. Otherwise the system may start producing bile and bright yellow water will be seen. In case of any problem contact the supervisor immediately. Avoid milk, milk products, and bakery products for three days. Avoid all chemically processed, preserved food, pungent, spicy, acidic and heavy to digest food for at least three weeks. Avoid non-vegetarian food for at least 40 days or preferably forever. Alcohol, tea, coffee, cigarettes, intoxicants and drugs avoid for at least 40 days or preferably forever. All fruits especially acidic fruits such as lemons, grapefruit, oranges and pineapples should be avoided for three days. The dinner should be same as the lunch. Take the second meal about 6 hours after the first meal or earlier if one feels hungry. The stomach must be filled to its capacity at both meals even if there is no hunger.